In a private children's hospital well away from the no-go zone, parents are holding on tight to their little sons and daughters hoping doctors won't find what they're looking for. Thyroid cancer. Tests commissioned by the local authorities have discerned an alarming spike here. 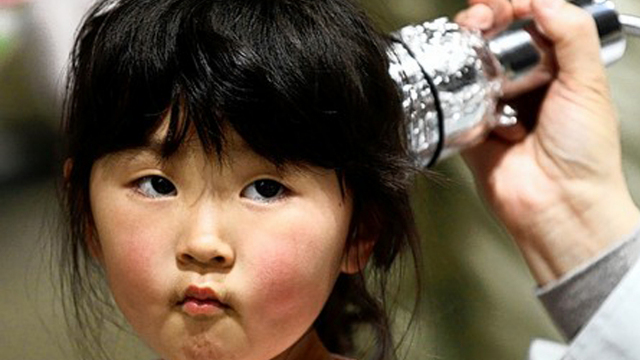 Experts are reluctant to draw a definitive link with Fukushima, but they're concerned. "I care because I went to Chernobyl and I saw each child there, so I know the pain they went through", says Dr Akira Sugenoya, a former thyroid surgeon. What terrifies parents most is a government they feel they can't trust. It's created a culture of fear; one which has led a number of women post-Fukushima to have abortions because they were worried about birth defects. "The doctors in Fukushima say that it shouldn't be coming out so soon, so it can't be related to the nuclear accident. But that's very unscientific, and it's not a reason we can accept", Dr Sugenoya insists. "It was disclosed that the Fukushima health investigation committee was having several secret meetings. I feel the response has been unthinkable for a democratic nation", agrees Dr Minoru Kamata from the Japan Chernobyl Foundation.